At Studio Friday Tina wants us to look at our fears. Studio Friday is challenging me right now to look at the things I don’t want to look at. And the subject makes it hard to try to make this blog a “happy” one (mistakes, fears, etc). Fears are not about being happy at all. Fears come up to show you that you need to change, take a grip of your life, and evolve. Stop thinking too much, Hanna! Fear is creeping into your heart and head late at night, or on days when I feel low. I don’t think about time a lot, but if I had to name a fear, that would be it. I fear that time is passing by all too quickly. I will soon become thirty, and there is so much left to do. If I’m lucky I will have a long life with lots of time left, but there is always the worry that you won’t have enough time when you are still “young”. I know that I can still do all these things when I become older, but the stress doesn’t disappear just because you know that, right? I don’t have a job yet! I have lots of projects that I want to finish, but no “great plan”. But today the sun is shining, the weekend is coming. I bought myself a new squared art journal in my favorite paper shop – and the lady in the shop wrapped it up for me! Now it feels like a present for myself. Maybe I’ll open it this afternoon… and pretend to be surprised. Studio Friday: This week’s topic was all about Fear. This entry was posted in Thoughts on Creativity and tagged studio friday. Bookmark the permalink. aw, honey, I am all most 50 years old and I am STILL young. don’t let fear keep you from living in the moment, at least some every day. 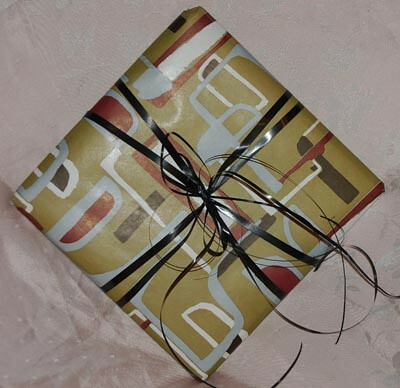 I sometimes also get things I’m buying myself gift wrapped so I can open it later on – it’s fun to open gift wrapped items! Enjoy the weekend! I wake up every day as Miles Davis says thinking about something to create. Usually it is scrapbooking or the loppis but life has become wonderful without the stress of a 12 hour job like I had before! you have accomplished, you will be amazed! square journals are the best! I love the way they feel in my hands! Hope it gets filled with good wishes and good happenings! i must do the same thing-buy something for myself and have it wrapped-i love the idea. i had a similar fear about time in the past and my siblings would always laughed at me everytime i tell them about it. i always fear that time is not enough with all the things i have planned to do in a day. I’m going to hit 40 this year, and I took wonder how much time I’ve got left to do the things I am meant to do here. Sometimes I feel like I haven’t accomplished much of great importance, but if I take a moment to reframe that in my mind, I realize that is not true. So, at this point in life, I’m really trying to cherish the journey each and every day instead of worrying about when the trip is going to be over. Yes to be 30 can be a crise time but as E.H.Eriksson says a crise can be a developement if you can solve the “problems “you are facing. Learn to live just now and enjoy every minute,thatsd life.Difficult but often when i read your blog I can see you enjoy your creative life. I’m 56 and still I live.What a happiness.Even if you get 17 lives you have no possibility to do everything. Love the new day and happy birthday in advance. Well if 40 is the new 30 then 30’s have to be the new 20’s – and you’re not supposed to know what you want to do yet – right? So you’re OK! I’m 37 – I was an accountant turned SAHM but don’t know what I want to be when I “grow up” yet except NOT an accountant anymore. But it’s cool…it leaves so many possibilities! Take care! I’m reading an excellent book just now called Time Alive by Alexandra Stoddard. The first section is about living in the present. Life is not a race, and today is the only day that we have to fully embrace life to it’s fullest. Tomorrow will come, but we can only live for now. Let’s make the most of it, and really take stock of all the greatness that happens in this one day, and look to tomorrow with enthusiasm. Hey, I’m 40 and getting even more excited about life and what it brings! 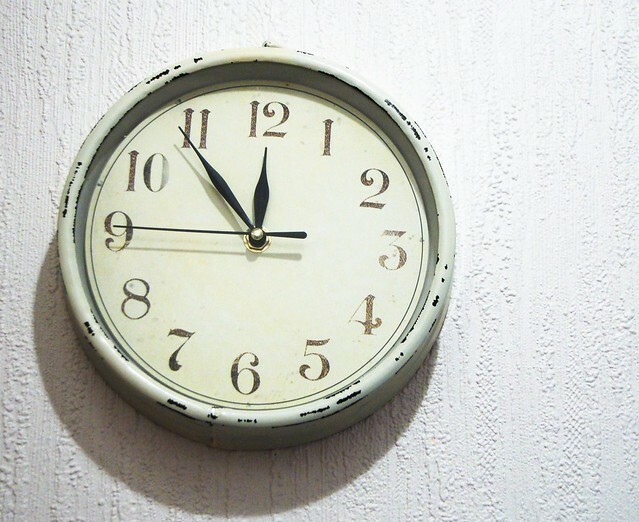 time is going to pass whether we fret about it or not. it is what we do with the time we’re given that means the most. it looks like you are dong the most with your time. good job! What a beautiful clock. I’m sure it will look just right in that future home of yours.